During a trip to Detroit last week, we had a chance to spend a couple of days with the all-new 2010 Chevrolet Equinox five-pasenger crossover sport-utility vehicle. We'd wanted to try this vehicle for some time, as most reviews deemed it vastly superior to the previous model. Certainly it's got crisper styling, a far nicer interior, and better gas mileage. 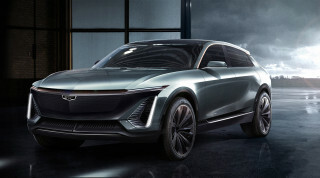 We were especially interested in the model fitted with a 2.4-liter, 182-horsepower four-cylinder engine and six-speed automatic transmission. That's the most economical Equinox, rated by the EPA in front-wheel-drive form at 22 mpg city / 32 mpg highway. Add all-wheel-drive and the mileage falls to 20 mpg city / 29 mpg highway. The four-cylinder 2010 Chevrolet Equinox LT carries a reasonable base price of $25,445, though ours added an AM/FM/XM Stereo and CD package combined with a navigation system, including voice recognition and a 40-GB hard drive for a stiff $2,145. It also came with a $495 power liftgate (which can be set to different opening heights) and a $245 "Cargo Management Package" that comprised the crossbars for the roof rack, a grocery net, and the rear cargo cover--which, honestly, we think ought to be standard on every crossover and station wagon. Total price at the bottom of the sticker was $29,075, including a mandatory $775 destination charge. With just a few more options, you're over $30,000, which starts to put you close to some fancier brands altogether. 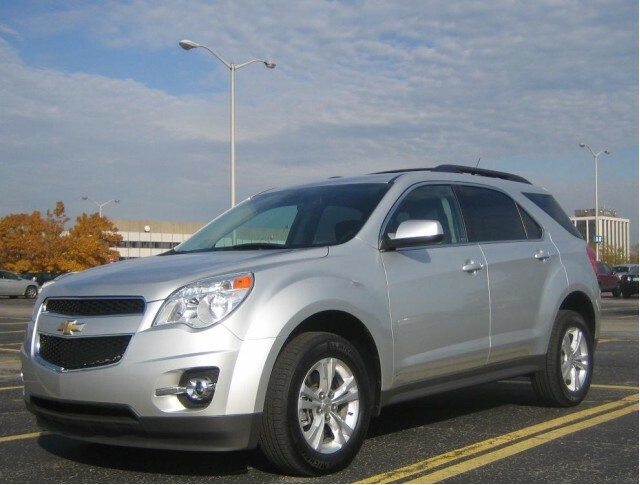 The new 2010 Equinox is definitely crisper and sportier than its somewhat slab-sided predecessor. With a thicker rear pillar and shorter rear windows, the entire vehicle looks shorter, perhaps to distinguish it better from the larger, seven-seat 2010 Chevrolet Traverse that's the next step up in Chevy's crossovers. The Equinox rode well on the sometimes badly broken roads around Detroit. The handling was tight, and there was less body roll than we had expected from a vehicle in which passengers sit relatively high. 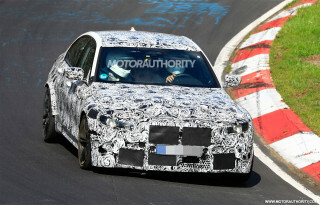 The four-cylinder comes with electronic noise canceling, which makes the car quiet enough that tire roar on bad surfaces is more apparent than it might otherwise be. But aside from crashing through the occasional truly cavernous pothole, the suspension is tight, the noise is low, and the 2010 Equinox handles in a remarkably car-like manner. When we picked up the 2010 Equinox, a little green light in the instrument cluster said "ECO". Indeed, the driver can push the ECO button located just ahead of the transmission lever to select a more conservative set of engine control software for better gas mileage. For fun, we decided to leave the ECO button engaged for our entire trip. The performance was adequate, though kickdown on hard acceleration produced a noticeable lag. But we kept up with traffic just fine. The Equinox in ECO mode felt, essentially, like it was heavily loaded, so it accelerated a little slower than it would normally have. Which is probably about what the revised software settings were meant to simulate. Overall, we registered 25.8 miles per gallon in 180 miles of mostly freeway driving, with a bit of suburban stop-and-go as well. That's close to the EPA blended mileage rating of 26 mpg (without ECO engaged, as far as we know), so we think fuel efficiency might be more like 24 or 25 mpg in the real world, when using regular mode. That's good, although not spectacular. GM has greatly improved the interiors of all its vehicles in recent years, and it shows best in mid-range vehicles like the 2010 Equinox. We appreciated that not only did the steering wheel tilt, but it also telescoped. The dash has a very nice two-tone treatment, the needles of the blue-and-chrome instruments sweep all the way over on startup, and even the Chevrolet logo on the navigation screen is a carefully rendered graphic that looks almost three-dimensional. One nice feature: note only a clock, but a date and an exterior temperature gauge on the display. The "premium cloth" seating was a mix of grey and black nylon blend, with a grey mesh weave almost like a basketball shirt over the black upholstery, with red stitching. It's a little startling at first, but the effect grew on us, mostly. For a $29,000 crossover, the Equinox LT was nicely--if not lavishly--equipped, with 17-inch aluminum wheels, remote keyless entry and remote starting, an anti-theft system, and one year of Onstar service free. The driver's seat had eight-way power adjustment, and even the 60-40 split rear seat slid and reclined. It took us a while to get used to the aggressive automatic dimming on the rear-view mirror, but it was nice to have. And Chevrolet warranties the powertrain for 5 years or 100,000 miles, which should comfort long-distance travelers. 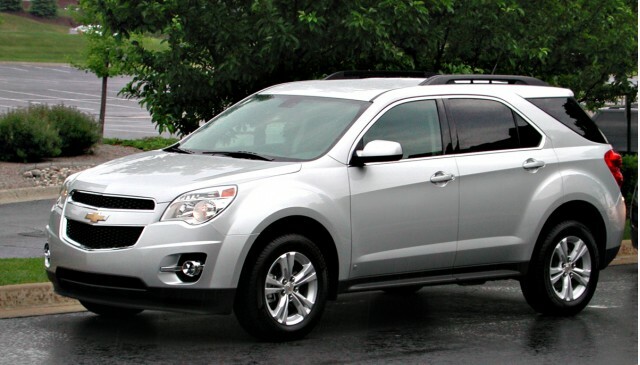 For us, the biggest flaw in the 2010 Equinox was its truly appalling rear three-quarter vision. The large side mirrors are an absolute necessity, because looking over your shoulder when merging shows little more than interior trim surrounding a tiny window opening. Thankfully, the LT has a reversing camera fitted as standard. We can't imagine how you'd back up otherwise, especially since the rear-seat headrests don't remove or fold down to open up vision in the rear-view mirror. Another grumble: We've said this before, and we'll say it again. How can ANY manufacturer not offer one-touch automatic raise on the driver's window, since they build it one-touch down on every car we've driven? It baffles and irritates us. Ridiculous. We liked the new 2010 Chevrolet Equinox, and feel that it's fully competitive with other small crossovers in the category, including the Honda CR-V and the Toyota RAV-4. 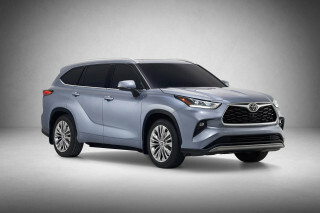 And it's definitely more stylish than the aging 2010 Ford Escape. While it had a few flaws and features we weren't fond of, it definitely returned good gas mileage in the ECO mode. Whether the vast majority of U.S. drivers would press that button and keep it down, however, is another question. High Gear Media drove a manufacturer-provided vehicle to produce this hands-on road test. Cruise the High Gear Media network!